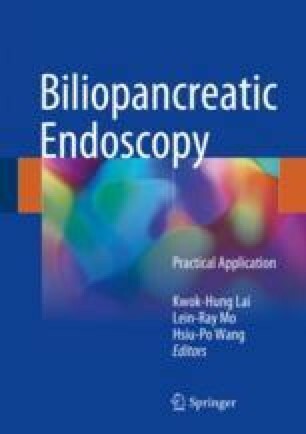 Endoscopic ultrasound (EUS) along with fine-needle aspiration (FNA) has become a popular method and safe bridge to accurate tissue diagnosis for biliopancreatic tissue acquisition. EUS-FNA can alter patient management after a definite cytopathologic diagnosis or tumor staging, and it also has an impact on facilitating medical decision-making of both patients and physicians. EUS-FNA procedure involves the aspiration of cell samples by passing an aspiration needle through the working channel of a curvilinear echoendoscope under real-time guidance into an EUS visualized lesion. Various techniques such as peripheral sampling and fanning aspiration have been developed and can improve the diagnostic accuracy and efficiency of the EUS-FNA tissue acquisition. EUS-FNA can be performed from either the trans-duodenal or the trans-gastric approach for pancreatic tumors at the head or body and tail, respectively. Besides, EUS can evaluate the biliary tract and associated tumors from the ampulla to the bifurcation. Being superior to ERCP tissue sampling in pancreatic tumors, EUS-FNA has comparable sensitivity to ERCP-related methods for biliary tumors in evaluating suspected malignant biliary obstruction. National Comprehensive Cancer Network. Pancreatic Adenocarcinoma (Version 1. 2017). http://www.nccn.org/professionals/physician_gls/pdf/pancreatic.pdf. Accessed 28 Feb 2017.